My experience has been that the average person has very little interest in a technical and detailed description of the anatomy and physiology of all the parts of the mechanism of the sense of sight. Everyone knows that the eye is round. Not many have inquired much further. Some could tell us that the round eye lies cushioned in soft tissue which lines the cave-like round hollows of bone that carry the eyes, right under the floor of the skull, which contains the brain. Some know that there are six muscles attached to the outside covering of the eye. At one end they are attached to the edge of the round hole in the rear of the cavity through which the optic nerve passes on its way back to the brain. Four muscles pass forward and are imbedded in the outer walls of the eye, near the front: one on top, one on the bottom, and one on each side. The other two are attached to the side-walls of the cavity, and are wrapped around the middle of the eye like belts, one passing over, and the other passing under the eye. The four muscles called the recti, passing forward on all four aspects of the walls, serve to move the eye in different directions. Working in harmony they change the position of the eye in the socket, and point it, unconsciously, whereever the owner wants to look. When they all contract equally, it is possible for them to change the shape of the eye and make it flatter on each end–that is, make the distance shorter between the front and the rear walls than it properly should be. Such an abnormal condition is present when an eye is what is called farsighted. The two so-called oblique muscles serve to compress the eye in the middle, and flatten it there, so that it becomes longer horizontally. In this condition the distance is longer between the front and the rear walls of the eye. Such a longer focal distance is necessary when the eye is focused upon nearby objects. The inside of the eye is divided into two compartments. Immediately behind the anterior wall of the eye is a small chamber, filled with a thin fluid which separates the front of the eye from the lens. The lens is fastened to the inner walls of the eye by a ribbon-like circular band of tendon. Behind the lens, filling the remainder of the eyeball, is a different liquid which resembles a jelly in consistency. The spherical shape of the eye is sustained by the pressure outward of the fluids with which it is filled. The crystalline lens consists of an elastic capsule holding in an oval shape its fluid-like contents. The walls of the eye are opaque, and light can enter only through the transparent lens in the middle of the front wall. The colored circle just inside the front of the eye is called the iris, and the opening in the center of that circle is called the pupil. This opening constantly varies in diameter. It is furnished with a diaphragm, of which the diaphragm in a camera is something of an imitation. Its function is to control the amount of light which is permitted to enter through the lens. In a poor light it enlarges, and in a strong light it contracts. The outer walls of the eye are composed of a dense, firm tissue, with a lining of opaque pigment, and contain vessels which supply the nutriment required. The inner membrane, lining the eyeball, is called the retina. This membrane, although it is thinner than the finest paper, consists of ten distinct layers. In its surface are spread out the nerve terminations, which are the microscopic endings of the nerves that receive and carry the impressions made upon the surface of the retina by the rays of light. We have some understanding of this when we rernem- ber the film in a camera, which also is acted upon, although in a very different way, by rays of light. The terminations of the nerve tendrils in the retina are of two kinds. They are distinguished as rods and cones, and there is some difference in their exact functions. The most sensitive part of the retina is a small area at the very hack o€ the eye in the center, which is called the macula. Here form and color and very sharp definition are registered. In this area there are no rods, which are nerve endings plainer and less highly specialized than the cones. Beyond this spot cones and rods mingle, but toward the front edges of the retina no cones are found. The rods seem to be more sensitive to the presence of simple light than are the cones. When light rays contact the surface of the retina a chemical transformation takes place. The force called radiant energy is changed into another form of energy. This new force is carried by the nerve fibres which terminate in the cones and rods, back through the collection of fibres called the optic nerve. In order that light rays coming into either eye, from right or from left, may be registered harmoniously, there is a switch in the course of the optic nerves from both eyes. This switch is called the optic commissure. The optic nerve of each side continues on until it ultimately reaches an area in the brain called the visual center, where the fibrils composing the cord are distributed to cells of the brain. This is the beginning of the mechanism of sight: the comparatively simple reception and absorption and assimilation of those rays of light which are reflected from external objects and come into contact with the retina. 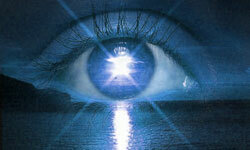 Vision is classified as a psychic function. The eye does not see. It is the brain that sees. The force or energy which courses up through the optic nerves to the vision center in the brain creates a transformation in those brain cells. Just how those impressions are registered so that they become conscious conceptions, has not yet been discovered. The process is a brain function, and part of the mind. Previous similar impressions upon brain cells make it possible for a harmonious co-operation of memories to interpret the newly registered images. This involves memory, imagination, and every element of the intellect. Does not this brief description impress the tremendous significance o€ the prevailing custom of neglecting all this marvelous mechanism? The electric light companies, aroused to their own neglect of an opportunity to sell light, are begin- ning to give the eye light it has been deprived of, and that help is being gladly received. This however is simply physics. The mechanism of vision quickly leaves the field of organic chem- istry, passes from the retina to the optic nerve, on to the cells of the brain, and into the realm of memory and mentality. There, in the higher field of the mind, is waiting the problem which the physician, who is interested in the rapidly failing function of human vision, must solve.